It was a long weekend. I had the afternoon to bake and I wanted something sweet but on the lighter side. These jam cookies hit the spot! There were a.) super easy to make and b.) super satisfying. 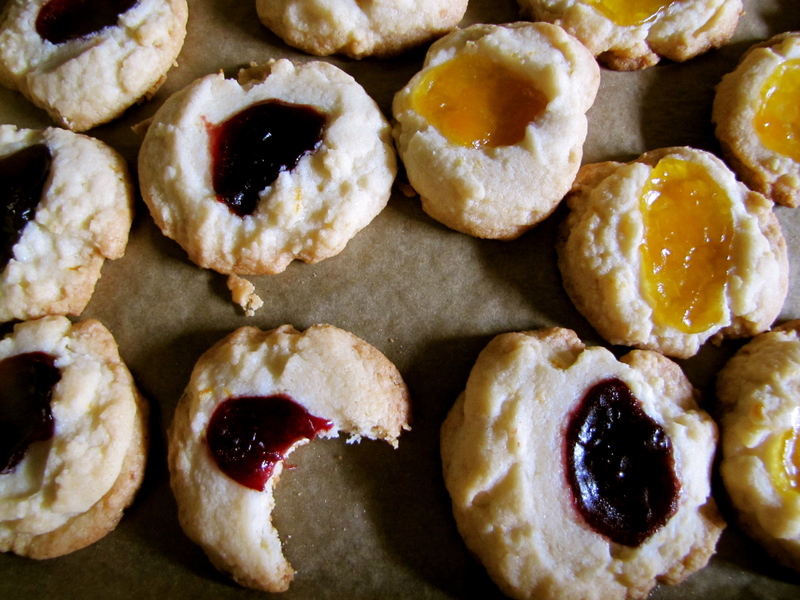 The orange zest elevates the cookie from a simple sugar cookie with a dollop of jam to a more dynamic flavor. As you can see in the photo, I had to have a bite when they came right of the oven before I even snapped a photo. 1. In a bowl, using a whisk, stir together the flour, baking powder and salt until evenly blended. Set aside. 2. In a large bowl, using an electric mixer, beat the butter on medium speed until it is soft and fluffy. Turn off the mixer and sprinkle in the sugar. Continue beating until pale. 3. Turn off the mixer and scrape down the bowl with a rubber spatula. Add the orange zest, vanilla extract and beat until blended. 4. Turn off the mixer and add half the flour mixture. Beat on low just until blended. Add the remaining flour and beat until blended. 5. Using a measuring tablespoon, scoop up a rounded spoonful of dough and then use your finger to push the dough onto one of the prepared cookie sheets. Fill both cookie sheets with the dough, placing the lumps of dough 2 inches apart so that the cookies have room to spread as they bake. 6. Dip your thumb in a little bit of flour and use it to make a dent in each ball of dough.